Laura and Adam Mull were hosts to the pre-party get-together at their Wheeling home. Laura was a member of the ticket committee for the sold-out ball at Oglebay Park last weekend. The ball kicks off a year of events celebrating Wheeling’s 250th birthday. The Wheeling 250 Committee launched a year-long celebration of the city’s 250th anniversary in grand style with a Twelfth Night costume ball at Oglebay Park last weekend. The fun-filled event drew a full house of area residents to Glessner Auditorium for a delicious dinner and dancing to music by Hit Play. 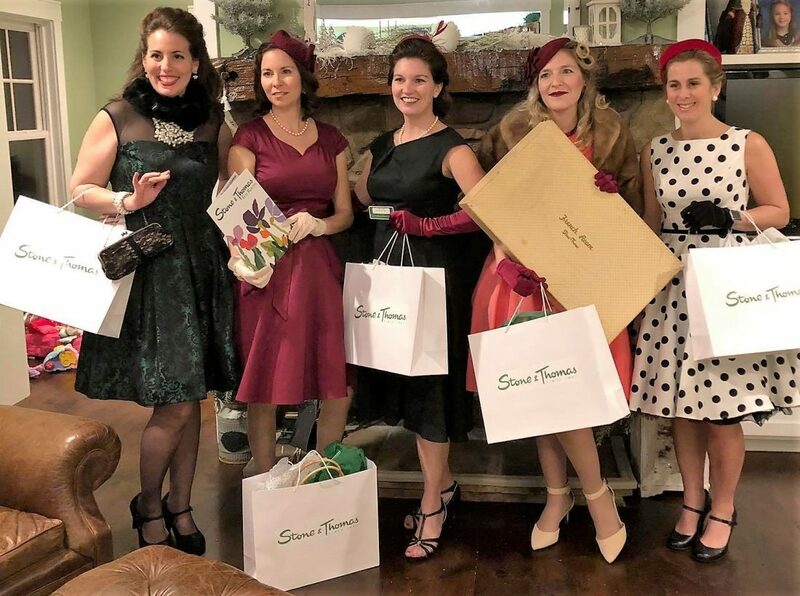 Most of the guests played into the costuming aspect of the festivities and donned outfits representing historic figures and various eras from the city’s past. It was amusing to see the interaction on the dance floor between intersecting generations of pioneers, flappers, hippies, American Revolution figures and Civil War soldiers, among others. The scene resembled a time machine in motion! Many of the costumes were quite clever as 21st-century guests interpreted their predecessors in a visual parade of the Friendly City’s heritage. Others celebrated Wheeling through fashion. For instance, Chris Villamagna wore a dress with a border featuring a well-known photographic image of the city’s early skyline. Her husband Robert Villamagna had planned to wear a giant head depicting Abraham Lincoln, but the artistic creation was damaged in a last-minute mishap. Family heritage also was on display as Joan Stamp wore a flight suit that her mother, the late Joan Stifel Corson, had worn while piloting planes from Stifel Field outside Wheeling. Stamp obtained the authentic flight suit from a display case in the aviation museum at the Wheeling-Ohio County Airport terminal. Pete Holloway saluted his father’s World War II adventures and the Greatest Generation with a military uniform. Jay Frey, chair of the Wheeling 250 Committee, wore his uniform from the Sons of the American Revolution. His husband Michael Hires donned a Wheeling Steel factory worker’s jumpsuit. Dr. Richard Glass put on a Civil War uniform to portray Union Gen. Ulysses S. Grant, while a Confederate or two also could be found in the crowd. Gerry Reilly and at least one other man chose the persona of the park’s namesake, Earl W. Oglebay. Debi Smith played a suffragette seeking the vote for women. Christina Fisanick took on the role of opera star Eleanor Steber. Dr. Clark and Elaine Milton were dressed as Moses and Lydia Shepherd. Another woman portrayed the older Lydia Shepherd Cruger. Lydia’s good friend, Henry Clay, also made an appearance. Wheeling Mayor Glenn Elliott and Cassandra Wells played Mr. and Mrs. Henry List. Wheeling Councilwoman Wendy Scatterday played Fort Henry heroine Betty Zane and even re-created her famous powder run by racing through the auditorium after dinner. Councilman Chad Thalman rocked the 1970s in a powder blue tuxedo, complete with ruffled shirt. Mark Prince depicted Sen. Joseph McCarthy, warning ominously that he had an important list to reveal. His wife Jeanie Prince acted as the Ohio County Republican Woman’s Club president who welcomed the controversial senator for his famous speech in Wheeling. One of the most innovative costume concepts was displayed by a group of young women who channeled their inner “Midge Maisels.” Laura Bissett Mull, Jenny Bissett Snyder, Kathleen McGowan Wack, Erika Koegler Weidner and Raina Burke put on vintage-style frocks, hats and white gloves to become “ladies who lunch” at the Tea Room of Stone & Thomas. Mull arranged to have replica credit cards and shopping bags bearing the well-known Stone & Thomas logo made for the fashionable shoppers to carry. Alex Weld wore a replica of a Mount de Chantal Visitation Academy uniform. A couple of Wheeling Central Catholic High School cheerleaders were in the audience, along with a man in a Wheeling Nailers uniform. Mary Haning made an appearance as the Pink Lady who roamed Greenwood Cemetery. Another woman, who shall remain anonymous, was going for the flapper look, but several wags joked that she resembled Alma Henderson, an infamous Wheeling madam. Phyllis Sigal reported for duty as Wheeling News-Register Society Editor Kitty Doepken. Her husband Bruce Wheeler played Ebenezer Martin, a Zane relative and early leader in Martins Ferry. David and Beth Weaver were “Puttin’ on the Ritz,” complete with his top hat and tails and her mink stole over a cocktail dress. At least two versions of Elvis were in the building. Barry Allen played a young Elvis Presley, accompanied by his wife Lisa Allen, a bobbysoxer in a poodle skirt. Paul Ashmore donned a white sequined jumpsuit to portray Elvis impersonator Earl Brown. Cheri and John DeBlasis showed up as bell-bottomed, headband-wearing hippies. Picking up the Twelfth Night theme, David Miller and his husband Peter Junkersfeld wore ornate jesters’ masks. Joel Pelaez also donned an elaborate mask, while Cynthia Ortiz Pelaez became an elegant flapper in vintage attire. Wearing costumes was encouraged, but not required, for the ball. A number of us appeared as Wheelingites of 2019. Another Wheeling 250 project, a photographic exhibit, titled “Listening Through the Lens: The Musical Portraits of George J. Kossuth from the Collections of the Oglebay Institute Museums,” is set to be installed Monday at the U.S. District Courthouse in downtown Wheeling. Frey said the federal government’s shutdown will not affect the exhibit. The Kossuth exhibit opens to public on Tuesday. It can be viewed in the atrium of the new federal building from 8 a.m. to 4:30 p.m. on weekdays. Visitors are required to present a photo ID to gain admittance.